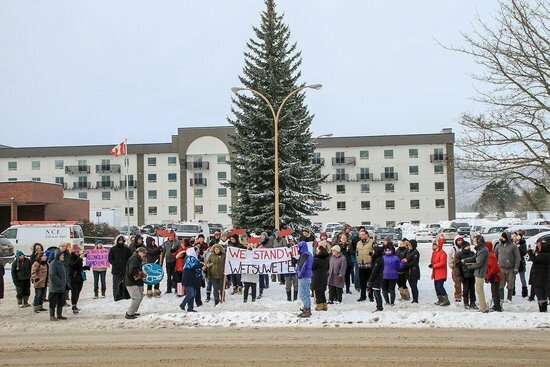 Terrace BC standing in solidarity with Wet’suwet’en! Last week, the federal government announced that the well-connected Canadian oligarchs, the Irving Family, and its Atlantic Towing division, had won a $67 million dollar contract to supply two stand by rescue “tugs” for the BC coast. In my interactions among my seafaring peers, the disgust over this decision is barely containable. Primarily because most know Atlantic Towing as a major Newfoundland and Nova Scotia operator in the offshore oil and gas industry, currently a lucrative job market. 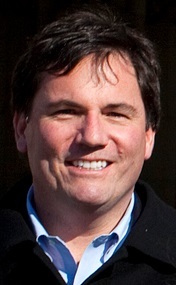 However due to local politics, any Canadian seafarers not based in Newfoundland are generally not allowed to participate in this market – this is part of the regulations – however, Newfoundland residents are free to work in any other market they choose, such as the great lakes, Alberta, and in BC. The ships highlighted in the press release are older platform supply vessels, veterans of the Newfoundland coast, big indeed, but designed for a completely different environment that the BC coast. It’s inlet laden coast, filled with tight passages and tricky shoals posed serious challenges to local mariners as it is. Based on my sailing experience on this coast, and even as an engineer, I can see these old vessels are not a right fit on the BC coast. In a further ‘FU’ to coastal BC people, the government bypassed the wishes of the Heiltsuk people of Bella Bella in this decision, and considering Atlantic Towing’s complete lack of infrastructure on this coast, one must assume that very few officers and crew from the BC coast will crew these vessels. Interesting expose' on Trudeau's commitment to indigenous reconciliation when he prefers the Irvings over a west coast proposal by the Heiltsuk nation of Bella Bella. The Heiltsuk and all west coast indigenous are excellent seafarers and in their own waters are unsurpassed by anyone. Awarding this contract to them and their partners will provide them with the hand up, not out they need to fulfil their destiny and provide excellent Coastal protection. For Trudeau to blatantly award this contract to the Irvings to provide worn, unsuitable vessels from the east coast, crewed by easterners is intolerable. West coast indigenous are excited to participate in the $1.5 bn Oceans Protection Plan and to have it turned into the Liberal Party Irvings Protection Plan is a smack in the face to peoplekind who can do a remarkable job. It is another betrayal of trust, not 'reconciliation'. "Trudeau's raven tattoo trying desperately, to tear itself from his body, escape, witnesses say." Is Walking Eagle the indigenous name for Trudeau? Isn't that tattoo cultural misappropriation? bs martin there's lots of successful Indigenous people who are not on board with your colonialist mentality. And there are a lot more who are. Like any other demographic, the majority support economic security over cultural marxism. Thanks MartinN for your answer. I disagree with it almost completely but that is not surprising. You reinforce my faith in the restorative benefits of independent analysis free from confirmation bias. 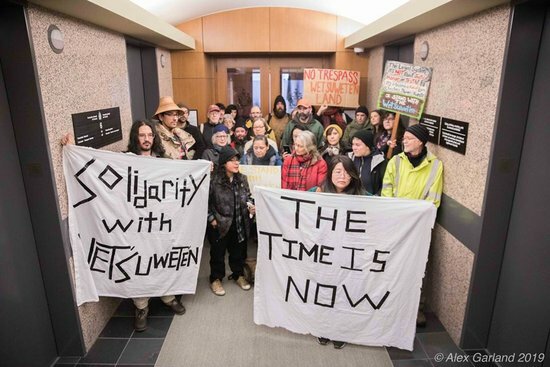 60+ actions as part of International Solidarity with the Wet’suwet’en! Joining rallies around the world in Solidarity with Wet'suwet'en rights and against RCMP attacks and the LNG pipeline. economic security yup my family included. but it doesn't mean losing culture it means balancing and moving into the future with both culture and economic security intact. 7 generations philosophy. my several greats grandfather Jean Baptiste Cope understood this at the time of the first Treaty signing in 1752 between the English even though he renounced it 6 months later. his words spoke to us in the now and how he saw the future could and would be. in todays world, Chief Gordie Planes is doing a great job of both, as an example of those FN not in a extraction resource industry struggle. so too with Chief Clarence Louie. then there's GRE and Jerry Montour. all sorts of entrepreneurial Bands and economic initiatives going on in BC too. inclusive to balancing with culture. Yes but there needs to be lots more. Too bad the Artful Groper is too busy with selfies and skiing to provide leadership on the reconciliation thingy. Walking Eagle indeed! We are gravely concerned by the RCMP's decision to bar journalists from the site of yesterday's raid, and their continued refusal to allow media access to the area today as police prepare for a raid on the Unist’ot’en checkpoint. The right to freedom of the press is guaranteed in our constitution and the right of the public to know is fundamental to our democracy. As a media outlet, we stand in solidarity with journalists who are being blocked from doing their jobs by our federal police force. We note with concern that the department of public safety and the minister responsible for the RCMP, Ralph Goodale, have referred requests for comment to the RCMP, describing the exclusion of media as an "operational matter." Restricting the constitutional rights of journalists is not an operational matter, and this precedent must not be allowed to stand. You are chasing red herrings thrown out to deflect from the real issue. To whit: every court decision has affirmed and reaffirmed that the Crown needs to "consult and, if necessary accommodate ". The most recent decision further advises that sending bureaucrats to take notes without any power to respond does not meet the threshold for consulting. Good faith consultation requires a crown representative with the power to "if necessary, accommodate". In other words, Trudeau needs to get off the ski hill at Whistler and settle the issue rather than doing the funky chicken avoiding it. It is the fault of politicians and their powerful apparatchiks to make the hard decisions that has led to this impasse. As long as they can subvert and deflect, they will and you, epaulo are a dupe for helping them. Einstein once famously replied, when asked about the difference between genius and stupidity: "Genius has limits". They need to be dragged to the negotiating table and forced to deal fairly and in good faith with the question of indigenous inclusion and accommodation. The side issues like pipelines will then sort themselves out. There may be no right way to do fossil-fuel megaprojects at all anymore if we’re going to have a hope in hell of meeting our 2015 Paris Climate Accord commitments, but as far as the massive LNG Canada Kitimat plant and pipeline project goes – with the showdown this week on a remote British Columbia backroad that immediately escalated into protests and marches and sit-ins across the country – the politics, promises and planning seem to have gotten just about everything wrong. You could start with the way Prime Minister Justin Trudeau cheered LNG Canada’s announcement last October that the green light LNG got from B.C’s NDP government meant full steam ahead for its long-planned $40 billion project, which is to include a new pipeline from Dawson Creek in the Peace River country to a liquifaction plant and export facility at Kitimat on the B.C. coast. A closer look at the LNG Canada consortium shows a lot less in the way of private sector investment than you might think. Royal Dutch Shell and Mitsubishi are private companies, but the other partners in the consortium aren’t. The Malaysian government owns Petronas. Petro-China is the listed arm of the Chinese government’s China National Petroleum Corporation. And the South Korean government own the Korea Gas Corporation (KOGAS). 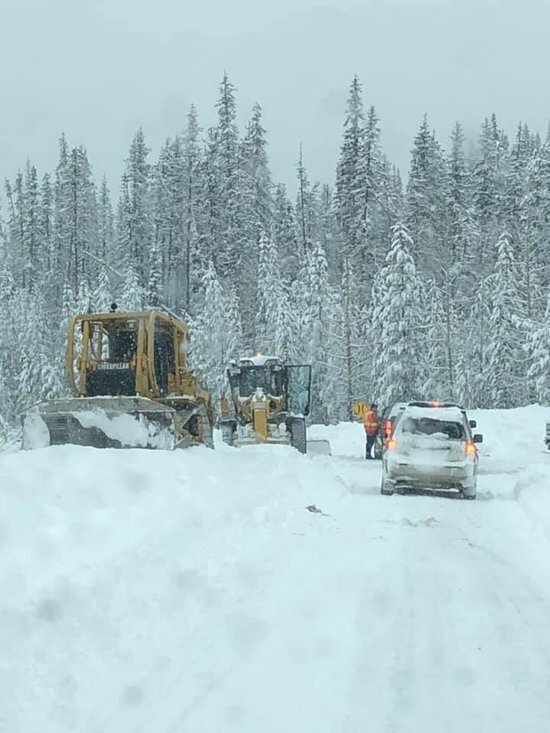 The words “meaningful partnership with Indigenous people” don’t exactly spring to mind, either, in light of that showdown on Monday more than 40 kilometres into the mountains on the Morice West Forest Service Road. A team of Mounties all kitted out in military gear had been dispatched to pull down a blockade that local Wet’suwet’en people had set up to keep TransCanada’s Coastal GasLink pipeline workers out of their territory. The problem here is that the Wet’suwet’en hereditary chiefs were not intending to merely “express their views,” peacefully or otherwise, and the Charter of Rights has nothing to do with it. The Charter comes under Section 25 of the Constitution. Aboriginal rights are protected in Section 35. 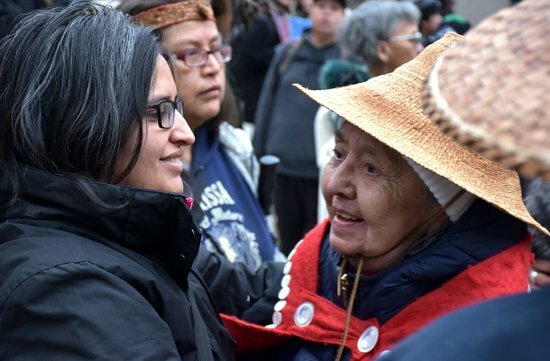 It’s the aboriginal rights and title of the Wet’suewet’en people that are at stake here, and that’s the subject that the federal Liberal government, and B.C.’s NDP government, are trying to avoid. The thing is, it doesn’t much matter what those 20 band councils have to say for themselves. 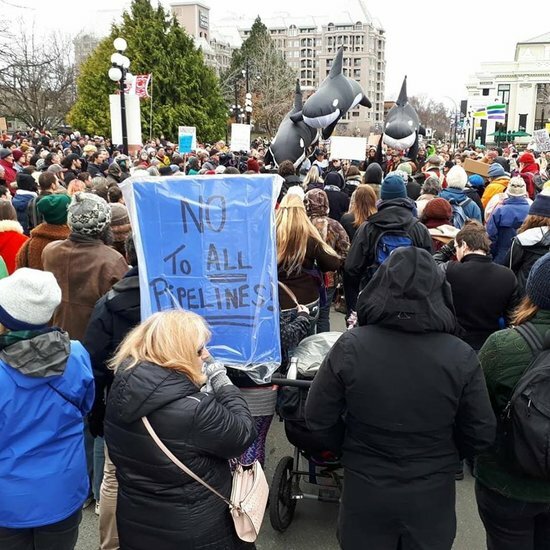 What matters is what the Wet’suwet’en hereditary chiefs and their clans and their house groups say, and for several years they have been saying, fairly consistently, thanks, but no thanks, no pipeline, no damn way. The band councils will do what they think they need to do, so fair play to them. But they’re like municipal governments. In Wet’suwet’en country, the law is the ancient feast system, and the hereditary chiefs are bound to uphold the law. That’s not just some hippie anthropologist’s point of view, either. It’s the view of the Supreme Court of Canada, in its specific findings in the landmark 1997 Gitxsan and Wet’suwet’en case, Delgamuukw versus the Queen. It was the hereditary chiefs who fought and won that court battle. In Wet’suwet’en country, aboriginal rights and title are vested in the hereditary chiefs and their clans and their house groups. If you think that’s a jurisdictional nightmare, bear in mind that the National Energy Board still doesn’t even know whether it’s involved in any of this, or whether provincial or federal jurisdiction holds higher sway. The NEB will be holding hearings in March to determine whether the British Columbia Oil and Gas Commission gave the whole project the go-ahead unlawfully. If that’s how things shake out, the whole project has to be re-submitted for approval under a formal, dismal, drawn-out NEB process. The other thing both the federal and provincial governments are trying to avoid is any public scrutiny of Trudeau’s and Premier John Horgan’s eloquent (but oddly imprecise) commitments to First Nations that their consent should be required, as per the United Nations’ guidance, for industrial developments such as pipelines to proceed in areas subject to some degree of aboriginal title. ..horgan is being dishonest. it's not a protest it's an indigenous right on their unceded territory. Another example of a deflection. Attempting to portray this struggle as a "protest" With indigenous on one side and Coastal Gaslink on the other while everybody's favourite Uncle John ( nothin to do with me, folks) tries to help. 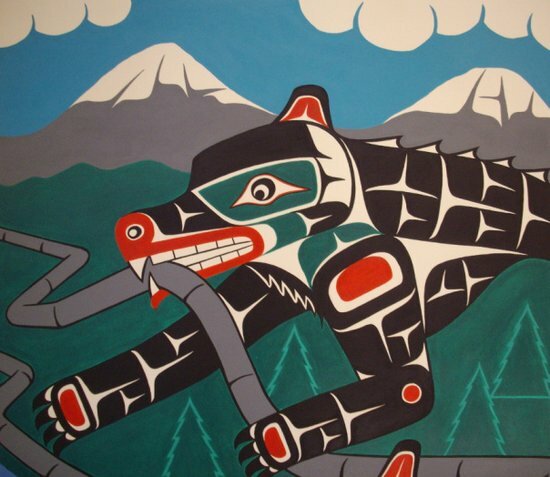 Horgan is just as guilty as Walking Eagle in the forked tongue department as they try to keep on good terms with indigenous while simultaneously trying to avoid the elephant in the room - not pipelines but Delgamuukw and the Crown's responsibility for this mess. Good article, huh. Too bad it isn't mainstream but I had to find it buried in some obscure media. You won't get the MSM to step out like that. Friendly Uncle John: The beatings will stop when morale improves. There is a major protest and solidarity march which has blocked Toronto's Bloor St Viaduct in both directions at rush hour. 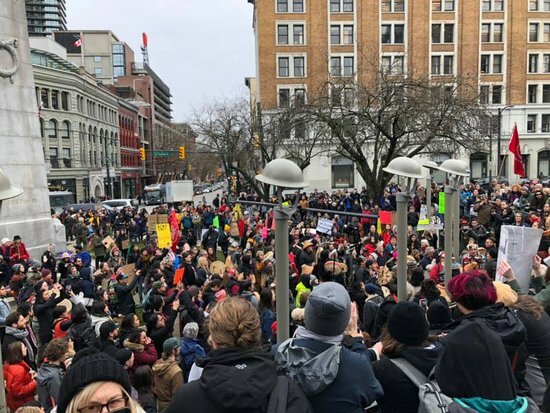 Just one day after hundreds of protesters gathered in downtown Vancouver, a smaller group has gathered in the Hastings-Sunrise area. Dozens of people are currently protesting at the intersection of Hastings Street and Clark Drive, blocking traffic into downtown and into the Vancouver Port in the process. Thank goodness we have a Premier who has been a protestor himself in a previous life. Governing is tough but having some personal background in protests can't hurt. They're not "protesting", they're trying to stop the very thing he supports. ahhh so it's just not white people "all nations" standing together. agree martin more economic development has to happen and it is. a couple of decades ago when i was closing in on 20 there was barely a whisper about FN businesses. the tide turned in 2 short decades. imagine 2 decades from now. “We recognize the right of individuals to protest. We recognize the rights of those across the country who wanted to voice their concerns about this project,” said Horgan. Horgan added that the pipeline project in northern BC has strong support from some First Nations. Yes, all the NDP scum are coming out of the woodwork pretending they support Indigenous sovereignty, which they clearly don't but they surely do recognize a political opportunity. "Today is once again proof - because some forget that there is no reconciliation to be had in Canada. Every single right we have as native people must be asserted, lived and defended - whether it is so-called court recognized or not. Delgamuukw didn't help Wet'suwet'en..rise." 2:55pm: ALL arrested on January 7th at Wet'suwet'en checkpoint now confirmed RELEASED from incarceration! ..this audio report states that the wet'suwet'en will now be going to a delgamuukw type court. When pipeline companies want to build on Indigenous lands, who do they consult? Hereditary or elected leaders? As the world watches tensions unfold over a natural gas pipeline project in northern B.C., questions are emerging over who companies should consult when seeking approval for resource projects. But who is actually in charge? CBC reporter Angela Sterritt breaks it down. He said he has spoken with Prime Minister Justin Trudeau and is confident a peaceful resolution can be found with the hereditary chiefs. Protesters in cities across Canada staged rallies to voice their support for those arrested Monday at a blockade near Houston in north-central B.C. Police officers from the Surete du Quebec dismantled a small protest on the Jacques Cartier Bridge Wednesday morning. Five demonstrators were arrested on the scene, and a handful of others reportedly fled. Traffic towards Montreal came to a stop for approximately 20 minutes while they spread out across the road, carrying a banner with a pro-environmental message. "This type of protest action is not tolerated by the SQ and those responsible will be prosecuted," said Daniel Thibodeau, spokesperson for the SQ. 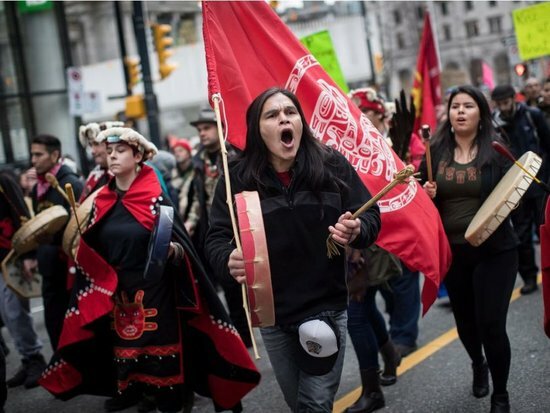 The impromptu demonstration was held in solidarity with the Wet'suwet'en First Nation in British Columbia. RCMP officers arrested 14 people from a blockade preventing access to a pipeline project in the Northern community on Tuesday. A number of solidarity rallies have been held across the Island of Montreal - including a rally outside of Prime Minister Justin Trudeau's consitituency office on Cremazie Boulevard. 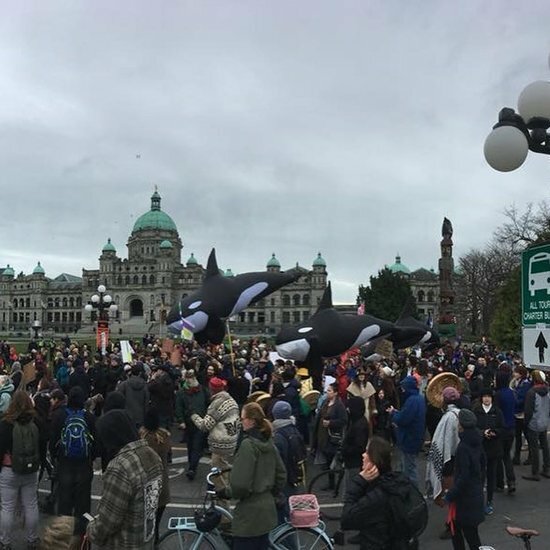 Spirit of the Buffalo in solidarity with Wet'suwet'en! Spirit of the Buffalo camp against the Line 3 pipeline in the prairies stands in solidarity with the Unist’ot’en blockade and the Wet'suwet'en people resisting LNG development in their homelands on the west coast. Join us this Sunday for trip to Spirit of the Buffalo camp to send a message to the Wet'suwet'en warriors, to let them know that we hear them, that these fights are connected, and that we are standing together. Please RSVP 'going' so that we know how many people to expect. Please also let us know if you have a vehicle and would be willing to drive. 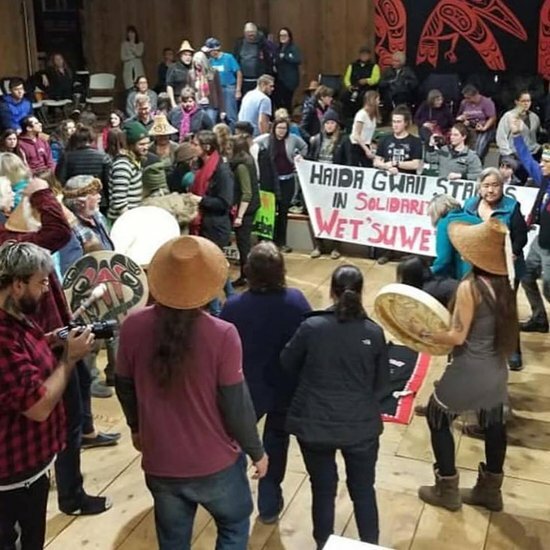 "Agreement would give pipeline workers access to area..."
The Wet’suwet’en Hereditary Chiefs have by absolutely no means agreed to let the Coastal GasLink pipeline tear through our traditional territories. On January 7th at the Gidumt’en access point, the RCMP used excessive and brutal force. We expected a large response, we did not expect a military level invasion where our unarmed women and elders were faced with automatic weapons and bulldozers. While the chiefs have a responsibility to protect the land, they also have a duty to protect our land defenders. Our people faced an incredible risk of injury or death and that is not a risk we are willing to take for an interim injunction. The agreement we made allows Coastal GasLink to temporarily work behind the Unist’ot’en gate. This will continue to be a waste of their time and resources as they will not be building a pipeline in our traditional territory. This injunction was against Warner Naziel, Freda Huson, and Jane and John Doe as individuals. Our efforts over the past month made the RCMP, Coastal GasLink, and the colonial governments recognize that this is not an issue of individual “protestors” but rather an issue of our house chiefs’ jurisdiction to make decisions on our own lands. We have fought for many years to make this point by politely telling it like it is. Now, with the world watching, with our voices reverberating around the globe, we have turned the tables. First to assail Trudeau was Will George, a member of the Tsleil-Waututh Nation. “You lied about being a climate leader. You don’t build pipelines by being a climate leader,” George said. Trudeau, who was answering a question about oil and gas emissions, asked George to “please respect” an audience member’s ability to ask a question. But George continued. “You’re a liar and a weak leader. What do you tell your children? Pipelines do not make climate leaders,” he said. Trudeau later faced a question from a woman named Tilly, who identified herself as a member of the Stl’atl’imx Nation. “What are you going to do to stop oppressing and holding our people under your colonization,” she asked. Trudeau said the federal government is focusing mainly on two areas when it comes to Indigenous peoples: services and relationships. He started talking about how “too many Indigenous communities are existing under boil water advisories” when Tilly interjected. “You are afraid to lose your comfort,” she said. “No I’m not, Tilly,” Trudeau responded. "We agree the rule of law has to apply, but doesn't that mean that when there's recognition of the proper title holder you deal with the proper title holder?" says Peter Grant, legal counsel for the Wet'suwet'en hereditary chiefs. Soft access/pre-construction activities in this case equate to the research and other studies that haven’t been done within the checkpoint area. Not construction. "We paved the way with the Delgamuukw court case and the time has come for Delgamuukw II." ..it's not enough to point to differing positions and then choose a side. this is not the way forward. there needs to be an understanding of why the views are differing. But Trudeau’s actions have not lived up to his fine rhetoric. For most of last year he was embroiled in a bitter and expensive controversy about the Kinder Morgan tar sands pipeline (see here and here for more info). And this year has not got off to a better start for him either. For the last few days, there has been a major confrontation between the Royal Canadian Mounted Police and First Nations about the building of yet more fossil fuel infrastructure: a $6.2 billion gas natural gas pipeline by TransCanada’s Coastal GasLink. The pipeline is due to transport fracked natural gas from northeastern B.C. some 670 kilometres to the coast where an LNG Canada facility is due to be built too. Indeed Trudeau has another crisis on his hands and once again his administration seems to be ciding with oil and gas. His political legacy is on the line once more. Members of the Wet’suwet’en Nation argue that they were never consulted about the pipeline and that it violates their constitutional rights. Whereas Trudeau is all spin and shine, the images from earlier in the week were the opposite. The RCMP “used excessive and brutal force” to enter one of the fortified checkpoints where the Wet’suwet’en First Nation were blocking the workers from gaining entry onto their protected and unceded land. ALERT - Even as our chiefs attempt to negotiate safe access to our Yin'tah with the RCMP, we have seen RCMP helicopters flying overhead. Wet'suwet'en and non-Wet'suwet'en members of the public are still being denied access to our territory by police, and we have received word that the RCMP are amassing forces in Houston. This is not over. All eyes on our camp. 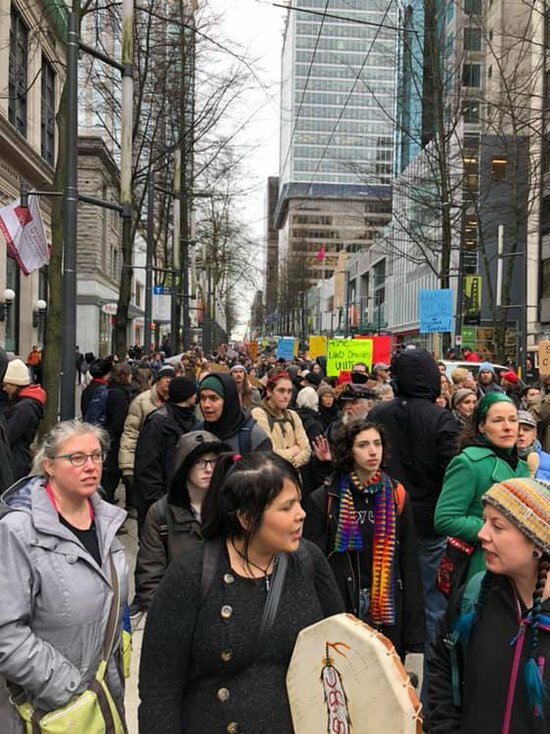 A rally was held in downtown Vancouver in support of those arrested at the protest camp in northern BC. David Suzuki was in attendance and has these thoughts on the situation.